7th Anniversary of a classic thrash and death metal masterpiece and rediscover this amazing piece of Christian metal history. Categories: CD-Distribution, DISTRIBUTION, DISTRO STORE. Tags: Death Metal, Roxx Productions, Thrash Metal. A special 7th anniversary to an album recorded completely by one man, one man who was a driving force in one of Australia’s most historic death metal bands Mortification for many years before venturing on his own to create this true thrash / death metal masterpiece, the man Mick Jelinic, and the band is his very own side project Terraphobia. 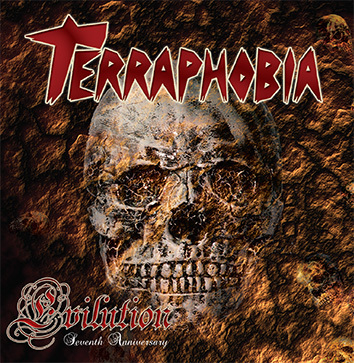 While Terrahobia can date back all the way to 1985, it was not until 2011 when the very first full length album EVILUTION would be released, which makes it seven years old this year. Released to critical acclaim this album featured every instrument actually being played and recorded by Mick himself, and he created a masterpiece in the process that is now out of print!